Register Log In ECN Forum Forums Photos for General Discussion Where's the Neutral? This is a further explanation for those not familiar with this violation. This type of device (switch/outlet combo) is something that is seen quite a bit in areas where it shouldn't be. 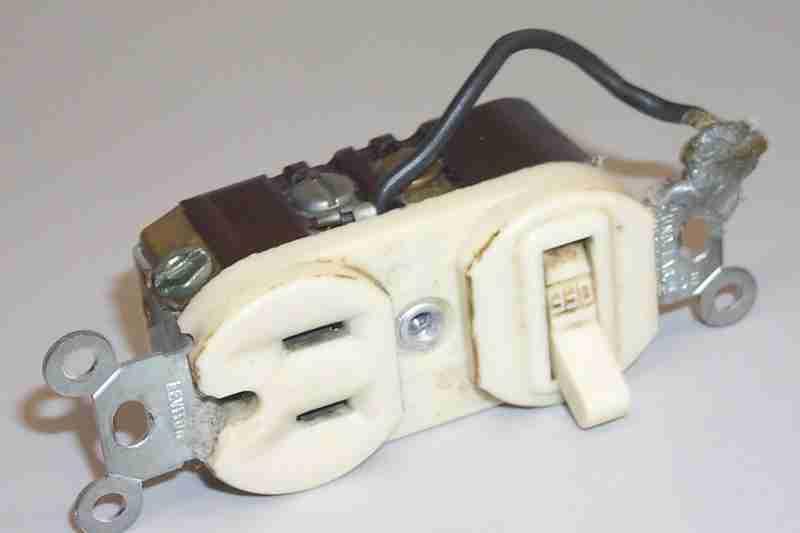 In Bathrooms and Garages that didn't come with outlets, many of these devices have been added by simply replacing the switch. There MUST BE A NEUTRAL present and connected to the outlet portion of this device. If you don't know what that means and the Hazards involved, you should definitely not be doing any Electrical work!! These are also areas that should be under the protection of a GFCI, either in the device itself (switch/GFCI combo) or the circuit breaker (GFCI breaker). Secondly, of concern is that, in these areas a dedicated circuit is often called for and that means that the outlet should not be hooked up with anything else, especially the lights. The outlet in a bathroom is supposed to be GFCI protected and on a seperate 20amp circuit breaker. That also means a larger wire size. This is to accomodate the very high wattage of today's Hairdryers. 1875 watts is roughly 16 amps, a typical circuit is only 15 amps. Common uses of this device in Garages are for plugging in an extra Refrigerator/Freezer or for the use of some power tools in a makeshift workshop. Once again, this is an area that needs GFCI protection and really should be on a different or separate circuit to prevent overloading and damage to the equipment being used on that circuit. Or... if a breaker or fuse opens when your emglo compressor fires up... put a 30A on it..
Or... Neutral and ground are the same thing...like a chassis ground on a car, right...? It never ceases to amaze me the things we run into... And, thank goodness, were discovered before harm was done.